We have said before that here in the UK we have an obsession with property, as evidenced by the endless re-runs of popular TV shows like Location, Location, Location and Homes under the Hammer! We never seem to get bored of watching programmes about buying, selling and building houses. The fact that Rightmove is one of the most visited websites in the UK with over 140 million visits per month is also testament to that fact. The busiest day on Rightmove in 2018 was February 19th with in excess of 40 million page views that day – Tuesdays are apparently the busiest day of the week and the most popular time of day to search for property is 8.00 pm. The extent to which major events affect those search numbers is surprising though, as these stats for 2018 released by Rightmove show. The wedding of Prince Harry and Meghan Markle in May last year had a noticeable affect on the number of Rightmove page views with the number of visitors dipping down significantly between 9.00 am and 12.00 noon whilst the wedding guests were arriving, only for them to pick up again during the actual ceremony. 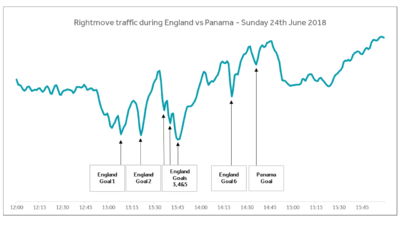 Similarly, during the word cup football match between England and Panama on 24th June, the traffic dips at the time of goals scored. Picking up again between the action on the pitch. This perhaps illustrating the habit many of us are guilty of – multi-screening. Despite a slightly challenging end to the year in terms of house price growth, the UK’s love affair with all things property does not seem to be diminishing. Here at Seddons, we are looking forward to a strong start to 2019 with the usual increase in buyer and seller numbers now that the distractions of Christmas and the new year are behind us. If you are planning a move in 2019 and would like to take advantage of increased buyer numbers at this time of year – get in touch with your local branch now to book your free property consultation. Our dedicated staff have many years of experience between them and can advise you on all aspects of buying and selling.